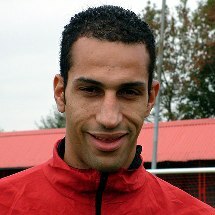 Striker signed for a small fee in 2003 from Runcorn FC Halton. Before that he played for Stalybridge Celtic amongst others. Was part of the NPL First division and Premier division championship sides and during his third season attracted the attention of Macclesfield Town for who he signed initially on loan due to the imposed transfer window before completing a permanent move for an undisclosed fee once the window re-opened. Moved on to Stockport County prior to the 2007/08 season.